Cynthia and Brian Bush got married and raised three more children after the 1972 adoption — but never stopped wondering about the three baby boys. "It's a sense of giving me some closure," Cynthia Bush, 61, said of the search the family launched this month. "I've lived with this for so many years." The Bushes' daughter, Christina Wilcox, is trying to help her parents be reunited with the triplets by posting details of the birth on Facebook — where it has been shared nearly 5,000 times. Clues have started pouring in, and the family has already learned that while they thought the boys were adopted together, they actually may have gone to separate homes. "It sounds corny but I always felt I've had something missing in my life and I wonder if that’s what it is," Wilcox said. Cynthia Bush was just 16 years old, living in upstate New York, when she became pregnant in 1971. Her parents were "appalled," she said, and sent her to stay with an aunt in Ashland, Kansas, until she gave birth. "At that time, it was seen as kind of shameful for her to be pregnant at that age," Wilcox said. An adoption through Catholic Charities was arranged, and a week after she had the babies on March 9, 1972, Bush returned home — where she eventually married Brian, a mechanic, and raised three more children. "I've always wondered about them," she said of the first three babies. At home, the adoption was a secret until a few years ago, when she told her younger kids about the long-ago trip to Kansas. "I felt if I couldn't be with them, at least they could have each other." Wilcox, 36, said she did some searching on the Internet to see if she could identify her siblings but couldn't find any good leads. Earlier this year, she called Catholic Charities and was told the agency could open the file, try to track down the adoptees and ask if they were interested in contact with their birth parents. In the meantime, Wilcox said, they suggested social media might be a quicker way to get the word out. She took a photo of herself holding a poster with basic information and posted it on her Facebook page. In the week since, she has heard from the daughter of the now-deceased doctor believed to have delivered the boys. They also got a message from one of the nurses at the Dodge City hospital who dropped a bombshell. The Bushes had always thought the three boys were adopted together. Cynthia said she insisted on it in writing. "I felt if I couldn't be with them, at least they could have each other," she explained. And for years after the adoption, a Kansas priest who was involved — but has since died — gave Bush's aunt updates on the boys, saying they were together and doing fine, Bush said. But the nurse distinctly remembered that the babies were separated — which would make the search more complicated. Cynthia Bush said her feelings about possibly finding the triplets are complicated, too. "I just have mixed emotions about it," she said. 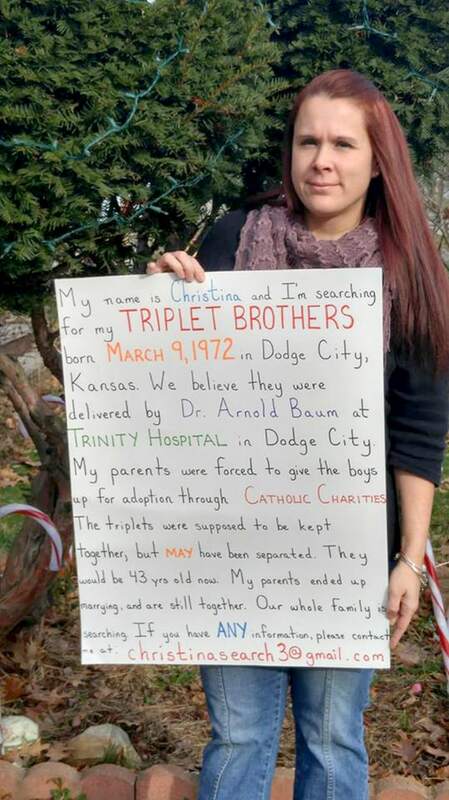 "I'd like to find them, but I don’t want to disrupt their lives completely if they don’t know they are adopted." Deborah Snapp, executive director of Catholic Charities of Southwest Kansas, said she could not discuss the Bush adoption or even confirm that her agency handled it. After providing proof of identity, the parents can open a search for $150, plus an hourly fee for research and attempts to contact the children, who would now be 43 years old. "More often than not, we're able to make contact," Snapp said. 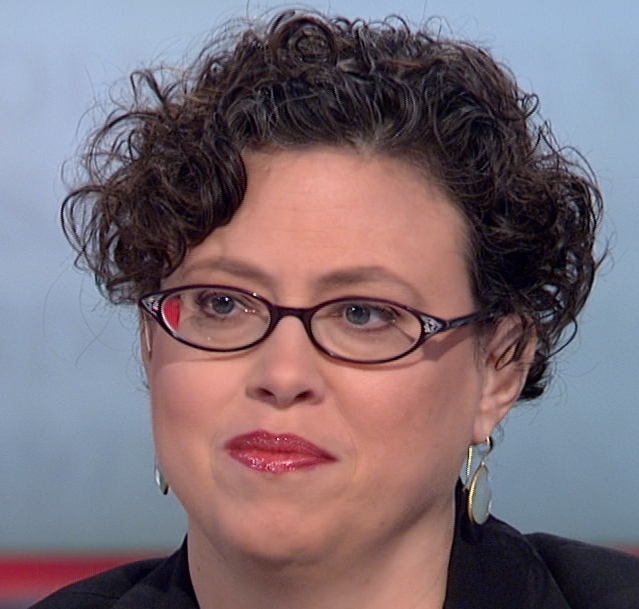 Wilcox said that locating the boys and finding out about their lives would give their mother peace of mind after so many years of worry and shame. "She thinks she did something wrong," she said. "But she didn't have a choice."